Spencer J. looks and sounds like his hero Buddy Holly, and his love of the music and style runs deep. Spencer started listening to Rock n Roll as a young boy and the feeling the music evoked has stayed with him ever since. A guitar player from the age of 12, Spencer is a skilled musician who accompanies himself and plays all the lead guitar breaks and solos in his impressive repertoire. Listen out for the choice licks in Thatll be the Day, Its So Easy, Brown Eyed Handsome Man etc. Its the classic Holly sound. The one-man show uses professional backing tracks all of which are authentic recreations of the original recordings. These are played through Spencers own state of the art P.A.T certified PA system, to stunning effect. Spencer calls this set up his Invisible Crickets. Spencer says: My shows are always fun and usually end up as sing-alongs as everyone knows the words to these timeless songs. The guitar Spencer uses is a beautiful 1950s style Sunburst Fender Stratocaster  the exact model that Buddy Holly played and made an icon of the Rock n Roll era. 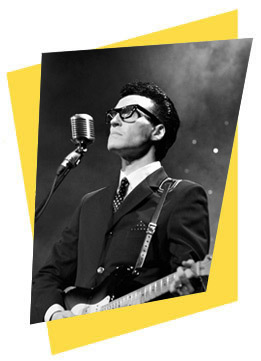 Spencer has portrayed Buddy Holly and delighted audiences at theatres; birthday and anniversary parties; weddings; corporate functions; hotels and restaurants; festivals; Christmas & New Year parties; tribute shows; themed parties and gigs of all descriptions. He will add that extra sparkle to your event and deliver the professional and memorable performance you desire. He will leave your guests or patrons smiling and shouting for more. Spencer will always do his best to cater for your specific requirements, just ask: the aim is to exceed your expectations.